The field of play shall be rectangular, the width of which shall not exceed the length. The width shall not be more than 80 yards (73.15M) nor less than 65 yards (59.44m) and the length shall not be more than 120 yards (109.72m) nor less than 110 yards (100.58m); however, fields of less than minimal dimensions may be used by prior written mutual consent of the competing institutions. The optimum size is 75 yards (68.58m) by 120 yards (109.73m). - A goal area is defined at each end of the field as follows: Two lines are drawn at right angles to the goal line, 6 yds (5.5 m) from the inside of each goal post. These lines extend into the field of play for a distance of 6 yds (5.5 m) and are joined by a line drawn parallel with the goal line. The area bounded by these lines and the goal line is the goal area. - Two lines are drawn at right angles to the goal line, 18 yards (16.46m) from the inside of each goal post. The lines will extend into the field of play for a distance fo 18 yards (16.46m) and joined by line parallel with the goal line. At each end of the field, a two-foot (60.96cm) line or a nine-inch (22.86cm) spot will be placed at a point 12 yards (10.97m) from the midpoint of, and parallel to, to the goal line. The line will be draw with 12 inches on both sides of the center line. The spot will extend 4.5 inches on either side of the center line. - The radius of the corner arc is 1 yard (1m) from the flag. ** A Corner Flag is a requirement and must be at least 5 feet in height (1.5m) and not have a point tip for safety purposes. ** There should also be flags located at least 1 yard outside of the field of play at either end of the halfway or midfield line. - Goals must be placed on the center of each goal line. They consist of two upright posts equidistant from the corner flagposts and joined at the top by a horizontal crossbar. The distance between the posts is 8 yds (7.32 m) and the distance from the lower edge of the crossbar to the ground is 8 ft (2.44 m). Both goalposts and the crossbar have the same width and depth, which do not exceed 5 ins (12 cm). The goal lines are the same width as that of the goalposts and the crossbar. Nets may be attached to the goals and the ground behind the goal, provided that they are properly supported and do not interfere with the goalkeeper. The goalposts and crossbars must be white. -The field of play is marked with lines. These lines belong to the areas of which they are boundaries. The two longer boundary lines are called touch lines. The two shorter lines are called goal lines. All lines are not less than 4 inches (10.16cm) in width nor more than 5 inches (12 cm) wide. The field of play is divided into two halves by a halfway line. The center mark is indicated at the midpoint of the halfway line. A circle with a radius of 10 yds (9.15m) is marked around it. *On artificial surfaces other lines are permitted as long as they are a different color and clearly distinguishable form the lines of play. - The field of play is marked with lines. These lines belong to the areas of which they are boundaries. The two longer boundary lines are called touch lines. The two shorter lines are called goal lines. All lines are not less than 4 inches (10.16cm) in width nor more than 5 inches (12 cm) wide. The field of play is divided into two halves by a halfway line. The center mark is indicated at the midpoint of the halfway line. A circle with a radius of 10 yds (9.15m) is marked around it. Below we have detailed out a quick reference guide for the various rules and regulations governing the marking of a soccer field in accord with various governing bodies. Please check with your organization to ensure that the guidelines and specifications used are in harmony with their own rules. Access a template for an organization youth soccer program and rules. Use this 6 page framework to enhance your own youth soccer program. The field of play must be rectangular. The length of the touchline must be greater than the length of the goal line. Goals must be placed on the center of each goal line. They consist of two upright posts equidistant from the corner flagposts and joined at the top by a horizontal crossbar. The distance between the posts is 8 yds (7.32 m) and the distance from the lower edge of the crossbar to the ground is 8 ft (2.44 m). Both goalposts and the crossbar have the same width and depth, which do not exceed 5 ins (12 cm). The goal lines are the same width as that of the goalposts and the crossbar. Nets may be attached to the goals and the ground behind the goal, provided that they are properly supported and do not interfere with the goalkeeper. The goalposts and crossbars must be white. The field of play is marked with lines. These lines belong to the areas of which they are boundaries. The two longer boundary lines are called touch lines. The two shorter lines are called goal lines. All lines are not less than 4 inches (10.16cm) in width nor more than 5 inches (12 cm) wide. The field of play is divided into two halves by a halfway line. The center mark is indicated at the midpoint of the halfway line. A circle with a radius of 10 yds (9.15m) is marked around it. 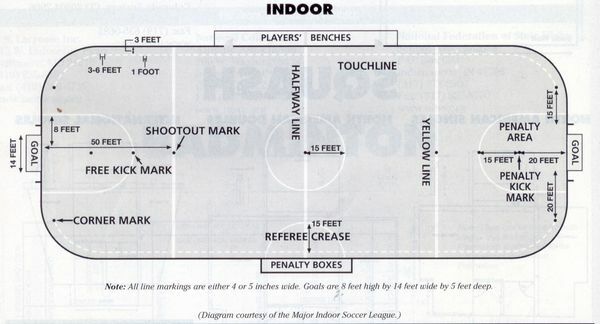 A goal area is defined at each end of the field as follows: Two lines are drawn at right angles to the goal line, 6 yds (5.5 m) from the inside of each goal post. These lines extend into the field of play for a distance of 6 yds (5.5 m) and are joined by a line drawn parallel with the goal line. The area bounded by these lines and the goal line is the goal area. Two lines are drawn at right angles to the goal line, 18 yards (16.46m) from the inside of each goal post. The lines will extend into the field of play for a distance fo 18 yards (16.46m) and joined by line parallel with the goal line. At each end of the field, a two-foot (60.96cm) line or a nine-inch (22.86cm) spot will be placed at a point 12 yards (10.97m) from the midpoint of, and parallel to, to the goal line. The line will be draw with 12 inches on both sides of the center line. The spot will extend 4.5 inches on either side of the center line. From each corner, a quarter circle, having a radius of one yard (.914m) will be drawn. A hash mark one yard (.914m) situated six inches beyond the field of play and 11 yards (10.05m) from the touch line will be marked perpendicular to the goal line at each corner of the field. A flag on a post not less five feet (1.53m) high and having a non-pointed top will be placed at each corner. A similar flag pole may be placed opposite the halfway line on each side of the field of play at least one yard (.914m) outside the touch line. The staff or post will be approximately 1.5 inches (3.81cm) thick and either round or square. The flag will be a bright color, about two feet (60.96cm) long by one foot (30.48) wide and secured to the staff or post. The base of the pylon or flag post will not be more than 8 inches (20.32cm) across. 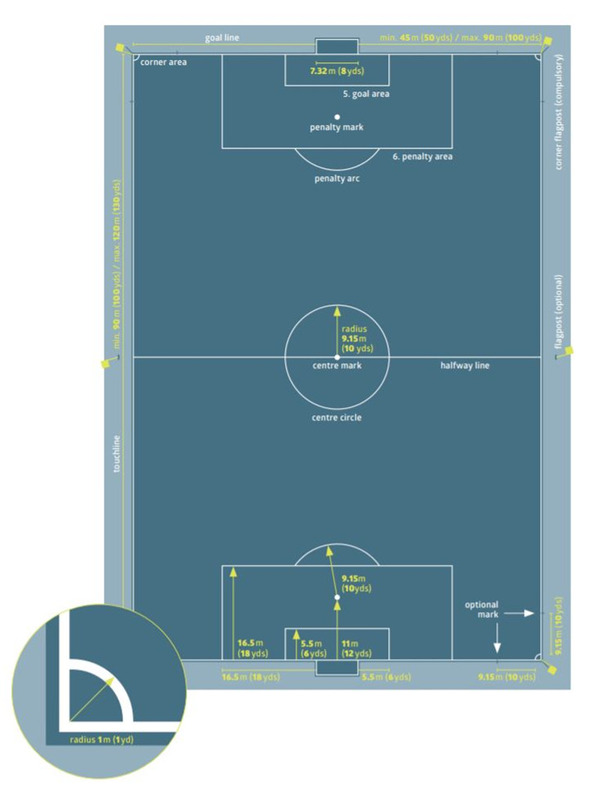 Team benches will be separated by a 10-yard neutral zone, and will be at least 10 feet (3.05m) from the touch line. The area will be marked parallel to the touch line and situated 10 feet from the touch line and extending 20 yards (18.29m) from the five-yard neutral zone measured from the halfway line in both directions. When marking a soccer field (world football) for the first time and subsequent seasons how many points or intersections should you be staking ? Here's my quick calculations and why these are staking points for pulling a string line when marking a football field. Looking for temporary marking solution on synthetic turf field for that weekend tournament where the lines come off with water or foot/brush action, no special cleaning agent, the consider aerosol chalk ( different chalk colors, red, blue, yellow) or bulk liquid chalk. Visit a new addition, Tru Mark's Trail Blazing Blog. Learn about field painting and turf tips, sports turf industry trends and future trends impacting our local community. Here is some information regarding soccer field operations. 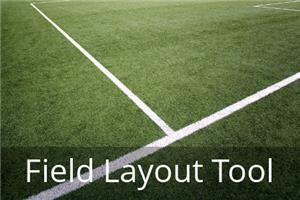 Download our fast and accurate Soccer Field Layout Tool to help stripe your fields. This simple layout tool takes the guess work out of creating a uniform soccer field no matter the dimension requirements. Review the soccer field requirements to verify the field size dimensions based on participant ages. The TruMark Soccer Field Layout Tool is designed for soccer organizations and field striping personnel needing a simple yet accurate tool to help in laying out and striping their sports fields. 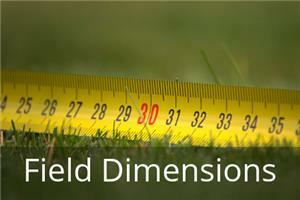 No matter what you requirements you can generate symmetric dimensions for any age group or space restrictions. 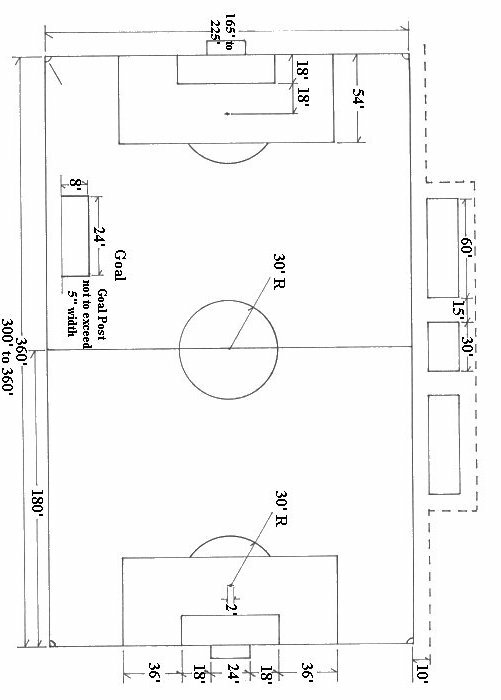 The soccer layout tool allows the user to plug in a value (in feet) into a cell below each listed soccer field dimension. 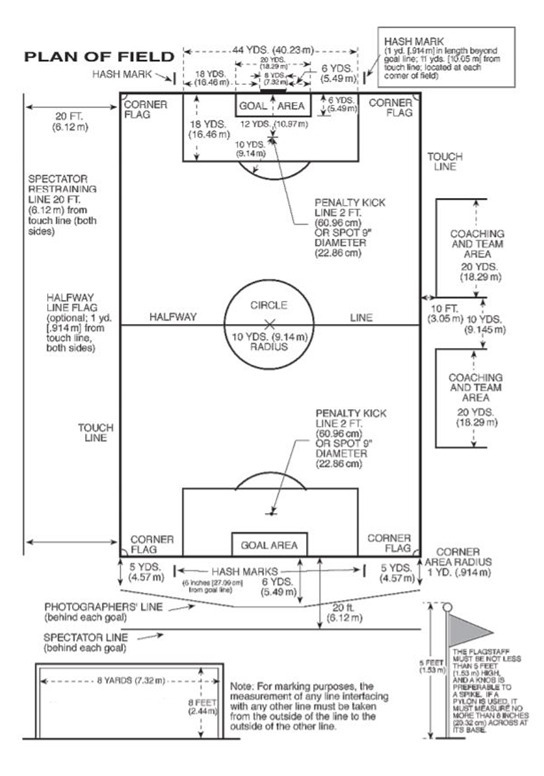 The orientation of the layout tool is based on staking out the full length of field down the center line of pitch/field intersecting the goalie boxes. The actual field staking procedure requires the use of two measuring tapes. One tape is staked or held at the Center Line Point at the middle of the field and pulled to the associated intersection points. The other tape is staked or held at the Center Point on the Goal Line (between the goal posts). The layout tool calculates the intersections for the two tape measurements listed in feet and inches or just feet. The Soccer Layout Tool reflects the stake intersections for 1/4 of the soccer field. The Soccer Field Layout Tool has gone through several updates as the result of users improving the overall layout and calculations. "The field marking tool is fabulous. I can't believe we used to lay out our fields any other way. It easily cuts layout time down to a third of what it was. You can also do the job with only 3 people and there is no arguing like before." "I appreciate the different methodology that is used. I have always marked a goal line first, then found the center & triangulated off that to where the center line meets the touch lines. I then triangulated off the center of the goal with various points on the goal line (goal box & penalty area) to find the PK & corners of the boxes not found on the goal line. I think your system is easier & perhaps more accurate." "The template stops all arguments and saves a tremendous amount of time each season. I like the simplicity and the accuracy that it provides. I have not found a more logical way or a method that requires fewer steps to get that job done. 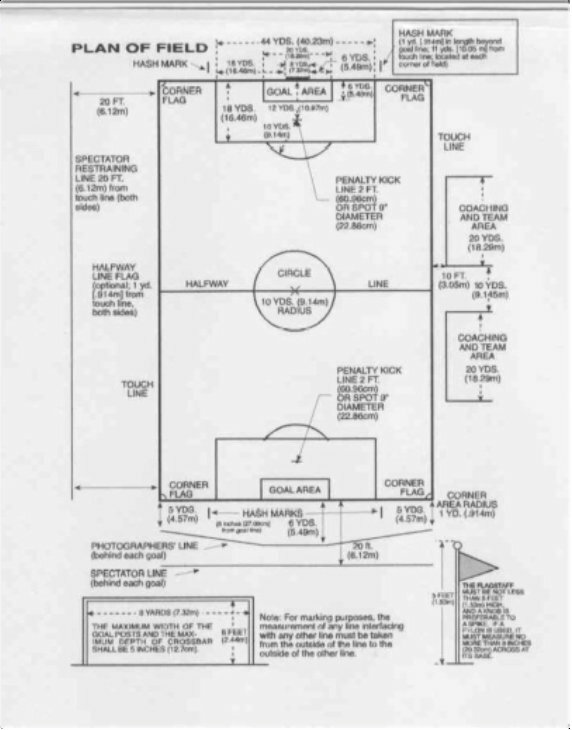 One of the bonuses of this system is that if the permanent goal standards are not correctly set, the field will still come out with the best possible configuration than using any other method." "I have to layout anywhere from 20 to 30 fields twice each year. The layouts that used to take a team of people hours to complete can now be done in less than 30-45 minutes by one person. I love it! AYSO Region 300, in the western suburbs of Chicago. We provide a soccer program for 2,500 - 3,000 players ranging in age from under 5 through high school. "The thought of no more stretching 300' tapes everywhere, Awesome! This tool is the best. My partner and I laid out and painted 3 fields in the same time it took a team of 3 to do 1 field." "I lay out fields for an American Youth Soccer Organization league. For regular season this involves 19 or so fields and must be laid out in a two week period. This method really helps. I have used the 'sum of squares' method using 3 tapes, as well as surveying instruments. Also, used to have one or two others to help. With this method I can do the whole process by myself. I would say that with the former methods I could do a field: layout, mark and paint in about 90 minutes. With your method it is just under an hour! Layout of 1/2 of the field makes the other 1/2 much easier. I make a sheet for each age group and field size we need and use that as a guide. Also, I have the program on a portable computer for any changes. I also use a simple GPS Gamin Etrex to locate center of field and center of goal line."